This DreamLine kit pairs the ENIGMA-X sliding shower door with a coordinating SlimLine shower base for a winning combination. The ENIGMA-X sliding shower door delivers a sleek, Fully frameless design, premium glass and high functioning performance for the look and feel of custom glass at an exceptional value. The coordinating SlimLine shower base incorporates a low profile design for an unobtrusive modern look. Go for the streamlined look and urban style of the ENIGMA-X frameless sliding shower door and coordinating SlimLine shower base for your bathroom renovation. Glass is treated with DreamLine exclusive ClearMax water repellant and stain resistant coating for superior protection and easy maintenance. Reversible for a right or left door opening installation. Premium 3/8 in. 10mm thick ANSI certified clear tempered glass. IMPORTANT All measurements should be taken only AFTER walls are finished tile, back walls, etc.. Requires minimum threshold depth of 2 3/4 in. The ENIGMA-Z sliding shower door and coordinating SlimLine shower base combine to create a convenient kit that completely transforms a shower space. The ENIGMA-Z sliding shower door shines with a Fully frameless design, premium glass and high functioning performance. The striking stainless steel hardware includes innovative wheel assemblies that glide effortlessly across the perfectly engineered track. A coordinating SlimLine shower base completes the picture with a sleek low profile design. 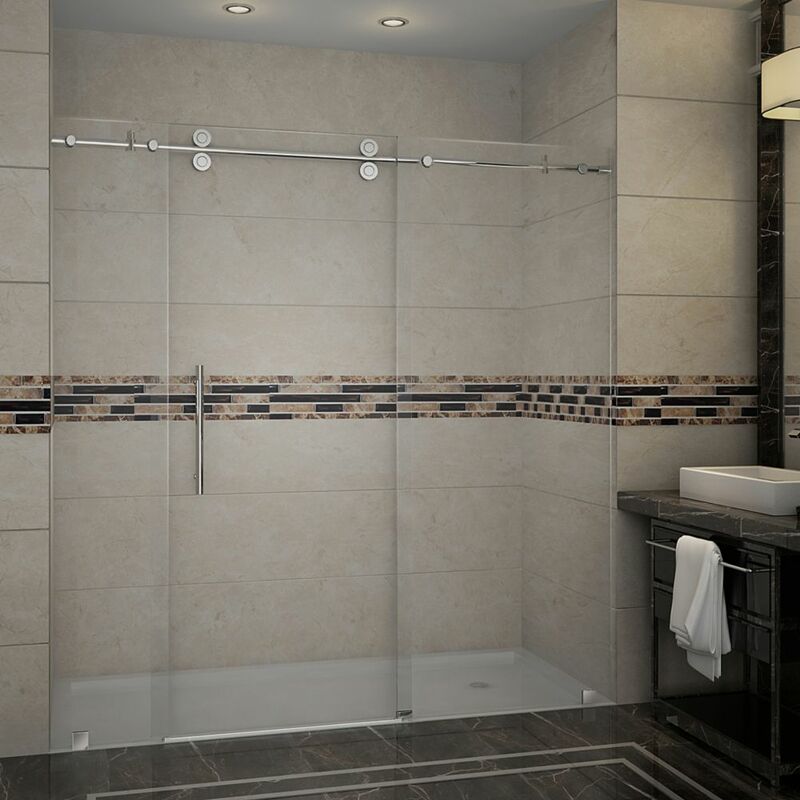 Achieve the look and feel of custom glass at an exceptional value with this efficient DreamLine shower kit. Glass is treated with DreamLine exclusive ClearMax water repellent and stain resistant coating for superior protection and easy maintenance. Frameless glass design. Reversible for a right or left door opening installation. Premium 3/8 in. 10mm thick ANSI certified clear tempered glass. DreamLine exclusive ClearMax protective glass coating. Requires minimum threshold depth of 2 3/8 in..
Langham 72-inch x 75-inch Frameless Sliding Shower Door in Chrome Establish a brand new look for your bathroom with the Aston Langham 72 in. Completely Frameless Sliding Shower Door. Accentuated with either chrome or stainless steel finished hardware, premium thick 3/8 in. (10mm) ANSI certified tempered clear glass, reversibly engineered for left or right hand opening and deluxe full-length seal strips to prevent leakage; this European-inspired, luxurious door instantly creates a sophisticated custom-look style for your bath at a fraction of the cost. Perfect for that alcove space in your bathroom. This model is engineered for both right and left handed door installation. This model does not include a shower base. Langham 72-inch x 75-inch Frameless Sliding Shower Door in Chrome is rated 5.0 out of 5 by 1. Rated 5 out of 5 by Dan from One waterproofing strip was damaged upon receipt. The manufacturer was... One waterproofing strip was damaged upon receipt. The manufacturer was very responsive and helpful. The door is very high quality. Is the width at all adjustable. &nbsp;I removed a tub to put a shower in and the width between the walls where the door would go is around 71 inches - will this 72inch door fit? The top rail can be cut down up to 4&quot;. This slider can accommodate finished openings ranging from 68&quot; up to 72&quot;. For more detail regarding installation and technical drawings feel free to email our support team at support@astonglobalinc.com or if you prefer, you may call in directly to 877-424-9699 select option 3 from the menu for tech support. The front fixed panels measure 291/2&quot; and 13 3/8&quot;.